While German is unsurprisingly the most widely-spoken language in Berlin, as a multi-cultural melting pot of a city you will hear all kinds of other dialects around you – and you may even be able to get by in certain areas with English alone (though this will not endear you to the locals!). Younger people in Berlin are more likely to be multi-lingual as languages have been a comparatively recent addition to school curriculums, and they may enjoy practicing their foreign languages by conversing with you, but don’t be fooled into thinking that just because somebody does not speak German as their mother tongue that they will be fluent in English; Turkish, Russian and Polish are also hugely prominent. Learn at least a handful of key phrases before you move to be on the safe side. If you are resistant to harsh winters, Berlin will be something of a culture shock for you. Much of the year brings a fairly moderate (albeit unpredictable) climate, with the sun shining during the summer and only broken up by periodic outbreaks of cloud and humidity. Rain is also a risk throughout a Berlin summer, with light showers frequent in June and August in particular – you won’t see many locals wandering the streets without an umbrella at these times of the year. When the festive season has passed, brace yourself for a winter of discontent – January and February usually sees the temperature bottom out at around freezing, and frost and snow becoming a regular occurrence. Fortunately, Teutonic efficiency dictates that this will not disrupt the operation of the city for long, but you’ll want to make sure you have sufficient layers to protect against the elements. Germany offers the same rules surrounding Visas for non-European Nationals as most nearby territories, permitting people to enter for up to three months for a vacation or family visit. Should you wish to work in the country, however, or stay beyond this point, you’ll have to apply for a Residents Permit within a week of your arrival – or take care of it before you leave by visiting the German embassy in Washington DC or one of the many consulates dotted throughout the US. The most commonly assigned permit is an Aufenthaltserlaubnis, or temporary residence permit. These are often assigned for one year at a time, though if you have a stable job offer on the table when you make your application it be considerably longer before it must be renewed – and even then, it should be something of a formality. After five years (or three if you are married to a German national), you will be eligible for a Niederlassungserlaubnis, the German equivalent of a Green Card. You will be expected to prove that you can contribute to the country in order to earn this status, as well as prove some degree of proficiency in the German language and running of the nation. In an extremely rare case, somebody may qualify for this permit immediately if their job is deemed important enough. Berlin hosts an American Embassy, located in Pariser Platz, which serves as the embassy for the entire country of Germany. This is just one of 150 such buildings throughout the city, so visitors from any territory will find themselves able to seek assistance from a friendly compatriot. Germany is a pet-friendly nation, and Berlin is no exception – though there are certain regulations that you will need to ensure that you are following before attempting to bring your tail-wagging chum on your relocation adventure. Firstly, ensure that your pet is fully insured and up to date with vaccinations (including rabies) no less than 21 days before you leave the USA, and ensure that you get paperwork that confirms this is the case – the German authorities will want to see this. Your pet will also need to be microchipped, and be the owner of a pet passport. If you have a dog as part of your family, you should know about certain rules that relate to canine companions in Berlin. Firstly, American Pitbull Terriers, American Staffordshire Terriers, Staffordshire Bull Terriers and English Bull Terriers are prohibited from entering Germany. If your pooch is not one of these breeds they’ll be welcomed, but must to be registered upon arrival and taxed at €120 per year. Dogs are typically are not allowed off-leash in the city center, but don’t worry, there are plenty of hound-specific locations that Fido will be permitted to play in. On-the-spot fines of €35 can be issued to people that do not pick up their dog’s waste (and you’ll be publically confronted and shamed by locals if you fail to do so), but the residents tend to absolutely love dogs and will express glee when they see one on the street. Don’t take your four-legged friend with you if you’re in a hurry; you’ll be mobbed by delighted children asking for permission to say hello and pet him or her. Berlin is not particularly well-served by boat as it’s not particularly close to any sea ports, so you may have to investigate the cost of air shipping through a major retailer. Most suppliers will offer a reasonable deal on boxes and crates, but it may be more cost-effective to simply purchase new furniture upon your arrival unless you are really attached to your current bed. Aside from an umbrella and some cozy sweaters for the winter? Pretty much anything goes, as long as it isn’t perishable. Bringing spoilable food in Germany from a country outside the European Union is a strict no-no. On paper, Berlin is tricky to find a steady job within – the city has an unemployment rate of 10%, which is double the rest of Germany. This is potentially down the creative nature of Berlin, where countless start-ups are born every day and fizzle out twelve months later, or potentially the multi-cultural nature of the city means that German speakers tend to advance further as they speak a common language with key decision makers. Marketing, IT and graphic design remain thriving industries, however, so if you have the appropriate skills you should be able to be find sustainable work in the German capital. If you have young family that will need to continue their education upon arrival in Berlin, or are potentially interesting in learning some new skills yourself, you will be spoiled for choice. Perhaps the most eye-catching international school in Berlin for US nationals is the John F. Kennedy School, which offers an American curriculum for students aged from 3-18. For a traditional German or European education, however, look into registration the Berlin Bilingual School or the Berlin Metropolitan School. Berlin boasts two top universities of equally high standing – Humboldt-Universität zu Berlin and Freie Universitaet Berlin. The healthcare system in Germany is financed by insurance plans. Employers cover the majority of this insurance, but you will be expected to make a contribution as part of your outgoing monthly salary, the amount of which is dependent on how much you earn. You will also have to pay a small fee (around €8, equivalent to about €10) to make an appointment with a doctor. This means that, should you need to undertake a medical procedure or surgery, you will not be subject to an unpleasant bill at the end. However, the German healthcare is the one area of life in the country that is not praised for its efficiency; some nationals complain that people are admitted to hospital unnecessarily, and kept in for too long. Although there are almost 200 hospitals in Berlin alone, this can lead to long waiting lists. If you can afford private healthcare, it may be worth looking into. Despite its popularity and excellent quality of life, Berlin is actually one of the cheapest major cities in Europe in terms of cost of living. A sizeable apartment in the city center, usually the most expensive part of any major city, is around €1,400 (or $1,600 dollars), and this can be halved if you are looking for a single-occupancy one-bedroom apartment. It will also be fairly economical to amuse yourself while in Berlin – dinner for two will not cost much more than €50, you will have plenty of change from €5 when you buy a beer, and public transport is very reasonably priced. Given that salaries are generally quite respectable, Berlin is a great place to find an affordable work/life balance. With essential expenses coming in quite reasonably, you should have some disposable income left over for some of life’s little luxuries. The Euro is strong right now, and Germany is one of the leading territories of international commerce, so Berlin is a great place to enjoy spending your salary in comparison to most major cities in the USA. When you first move to Berlin you’ll be able to use your US driver’s license to get around (and to hire a car, if that’s a necessity), but that is not a permanent solution. German law dictates that you’ll have to switch to a German equivalent (known as a Führerschein). How simple this is depends on which State you are currently a resident of – some territories enjoy full reciprocity and will permit you to exchange licenses with just a handful of documents and a small admin fee, while others will require you to take lessons and a new test. Once you have established whether you enjoy reciprocity, look into the next steps that may be required of you. If you are reliant in getting around Berlin using public transport, the first thing you should look into is a Welcome Card, which will allow you to hop on a variety of different buses, trains and trams throughout the city. These are largely designed for tourists though, so you may find it more cost-effective to eventually switch to a weekly travel pass once you have mastered whichever routes you will be using most often – or, of course, just grab a one-off ticket for your journey if necessary. The S-Bahn train is a great option for commuters, hurtling along to various surrounding cities and suburbs at high velocities. The U-Bahn, meanwhile is a subway service that runs throughout the city (and beyond), running 24 hours a day over the weekend. Buses also run all day and night, split between standard bus services and night buses (nachtbus). If you’re not in a hurry you can also use a tram to scoot around the city center. Two airports; the major Tegel (TXL), which serves all long- and short-haul flights out of the city, and the smaller Schönefeld, which caters for shorter distances and low-cost airlines, serve Berlin. Tegel is a thriving hub of activity, but is scheduled to close around 2019/2020, when the new Brandenburg opens. This new airport will be located beside Schönefeld, which will also be expanded to accommodate one giant uber-airport to service all of the city’s transport and commerce needs. Being based away from the coast, Berlin is not really a city that thrives in sea trade and the closest port is over three hours’ drive away. There is so much to choose from when it comes to neighborhoods in Berlin that the biggest challenge you’ll face is settling on just one. If you want the real Berlin experience, Mitte is where it’s at – this is the city in a microcosm, packed with culture and attractions (though it attracts the tourist traffic that can only come with such a destination). Tiergarten is the closest locale to the American embassy, and is arguably the cleanest part of the city, Charlottenburg is the most chic and upmarket area in Berlin, expensive but gorgeous, and the achingly hip have the time of their life in Friedrichshain or Kreuzberg, where every building wall is a canvas for street artists. Prenzlauer Berg is the closet Berlin comes to a white picket fence family environment, or for something a little more commercial and traditional, check out the sleek surroundings of Potsdamer Platz, where you’ll find the chains that you know and love from home. Wherever you choose to base yourself, you will not be subject to any resistance from the locals – Berlin is a hugely welcoming city to people of all colors and creeds. Just try to avoid giving off the vibe of being too fusty or ‘mainstream’ – this is a city that embraces life outside of the ordinary, and encourages its residents to express themselves and be as quirky as they are comfortable with. Many different locations have held the title of European City of Culture, but for many, this will always be Berlin. The city boasts hundreds of art galleries and members of the art trade flock to the Berlin like moths to a flame, so if you have an appreciation for the more highbrow side of life this is the city for you. Two events dominate Berlin each and every year. Berliner Modewoche, aka Berlin Fashion Week, brings gifted young designers from all over the world to the city every January and July. Among its many unofficial titles, Berlin is considered to be something of a fashion capital, and the city’s Brandenburg Gate is turned into a makeshift catwalk twice-annually. Meanwhile, every February sees the Berlin International Film Festival roll into town. Premieres, red carpets and high-powered meetings are the order of the day during this month. Outside of these events, Berlin also turns into a winter wonderland every time the holidays begin to roll around – like every major German city, you’ll find an abundance of charming outdoor Christmas markets lining the streets in the build-up to the festive season. As a country, the Germans are soccer-crazy. You’ll have to trek to Munich or Dortmund for the most successful club teams in recent memory, but you can catch Hertha BSC at the Olympiastadion (Olympic Stadium) every other week. You won’t struggle to pick up a ticket on the day of the game, as the cavernous surroundings mean the stadium is rarely more than half full. It’s a different story when the national team comes to town, though – Germany tour around the country when they play their international fixtures, though the Olympiastadion tends to attract the biggest and best fixtures. It also hosts the final of the annual DFB Cup tournament each year. You’ll also be able to enjoy some familiar sports in the city, though – basketball and ice hockey are both hugely popular in Berlin. Both these sports are played in the Mercedes-Benz arena, where Alba Berlin have captured a record number of Basketball Bundesliga titles, and Eisbären Berlin enjoy a stellar reputation in the DEL Championship. Runners will delight in the Berlin marathon, and those who enjoy extreme sports should check out the Mellowpark, the largest BMX and skateboarding venue in Europe. Berlin is largely a safe city, especially by day, but unfortunately crime statistics have been on the rise in recent years. Some attribute this to a spike in rent prices and some degree of gentrification, which has frustrated some of the locals. It’s also of some interest to note that certain activities have been decriminalized in order to make for more agreeable statistics, though this revolves around petty theft such as shoplifting and should not impact on your quality of life in the city. 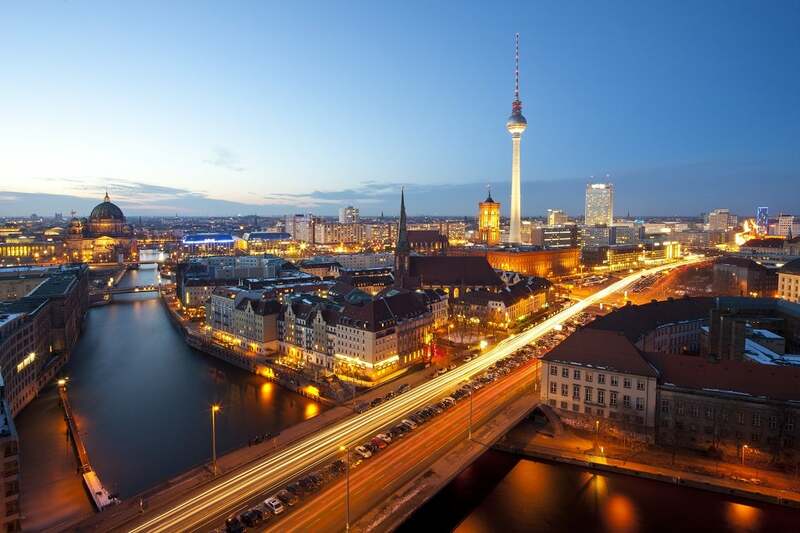 If you’re looking for a new home with a thriving nightlife scene, you won’t find a major city with more going for it than Berlin – there is lot more to this place than David Hasselhoff concerts. It won’t come as much of a surprise that beer is a big deal for Berliners – though it’s rarely as simple as just ordering a pint in a bar. Craft beer is plentiful, with many bars boasting their own microbreweries. Many pubs and bars will also recreate the celebrated Oktoberfest experience, and traditional German snacks such as pretzels will be plentiful. You’ll also find no shortage of live music – often performed by musicians clad in lederhosen. If you’re looking for a traditional German feast, you’ll also be well served – pack your stretchy trousers and prepare yourself for carb-heavy piles of sustenance. Don’t panic, though, there are plenty of other forms of worldwide cuisine available throughout the city. As such a historical and vibrant place, it’s hardly a surprise that Berlin has been provided the setting for countless classic novels and a rich vein of inspiration for historians. Here is some recommended reading to give you more insight into the city, though this will just barely scratch the surface. Alone in Berlin, by Hans Fallada –heartbreaking, nail-biting and wholly engrossing, this tale of the capital city under Nazi during WW2 – and the average couple that dare to spread anti-war propaganda – uses Berlin as a character in itself. Berlin Alexanderplatz, by Alfred Döblin– arguably the most celebrated work by a German author of all time, Berlin Alexanderplatz has been described as a Teutonic Ulysses – high praise indeed! The Gift, by Vladimir Nabokov – if you’re looking for an outsider’s perspective on life in Berlin, investigate Nabokov’s final Russian-language novel – set in the 19th Century, but inspired by the author’s time spent in the city during the 1930s. Berlin Now: The Rise of the City and the Fall of the Wall, by Peter Schneider – the Berlin Wall is such an intrinsic part of the city’s history that it cannot be ignored, and this book tells you how the destruction of the divide has changed Berlin forever more. Berlin Rules: Europe and the German Way, by Paul Lever – when in Rome, do as the Roman’s do – and more importantly, stay on track of how to stay on the right side of the locals by brushing up on the unofficial etiquette of Berlin. Berlin: Imagine a City, by Rory MacLean – by now you will have learned just how bohemian Berlin is, and this book – comprised of a number of accounts from the last fifty years – will shine a light on just how this amazing city has evolved.